There were two major influxes of Russian migration during this period. The first wave arrived in Northeastern China to help build the China Eastern Railway, a southern spur of the Trans-Siberian Railroad that cut across Manchuria creating a shortcut to the port of Vladivostok. The railroad junction town of Harbin first received its Russian immigrants around late 1890s. By the early 1900s a thriving Russian community was already established. Then a succession of wars and revolutions, including World War I, the Bolsheviks Revolution, and the Russian Civil War, sent a stream of refugees to China. This second wave of migration arrived into an already crowded Harbin, causing a large portion to continue south to China’s commercial center of Shanghai. 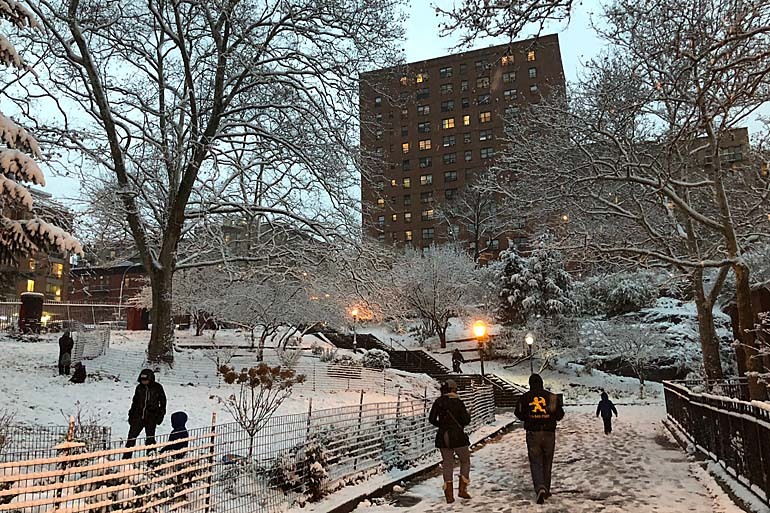 Between their arrival through the end of the Second World War and the subsequent victory of the Chinese Communists, the immigrants lived in hardship and uncertainty. Struggles between the Red Communist’s Soviet supporters and the resistance White Russians exacerbated the suffering. Still, they maintained a semblance of community and tried to preserve their culture and identity. One way of fostering their community was through their food. Many immigrants opened restaurants in Shanghai along Xiafei Road (now Middle Huaihai Road), which was then known as Little Russia. The foods served in these Russian restaurants, along with other European restaurants serving French, English and German food, were collectively known as Haipai (海派) or foreign cuisine. 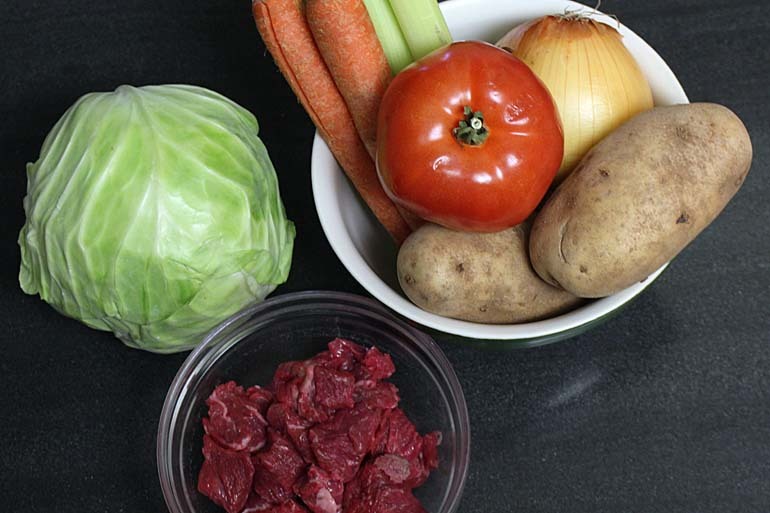 Among the best known and beloved Haipai foods is a beef and cabbage borscht. 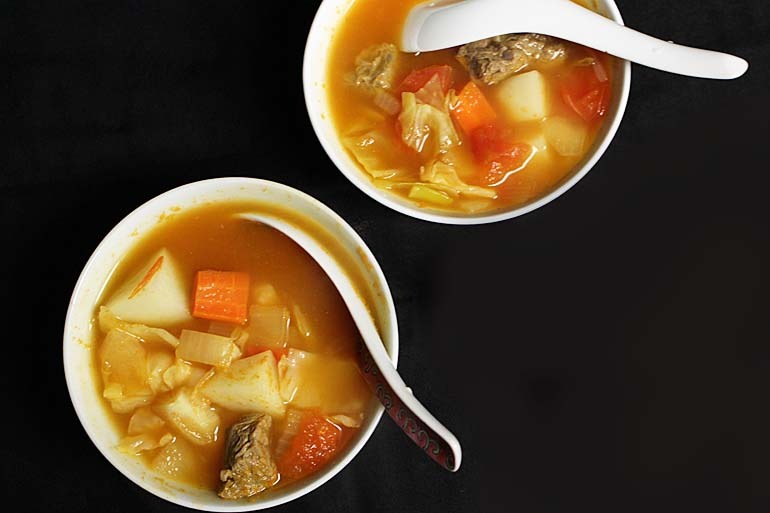 Known as luosong soup (羅宋湯), it is named after the phonetic translation of “Russian.” Where and when this soup was first introduced to the Chinese is open to question. Harbinites claim that it was first served in Harbin by the early Russian immigrants. But Shanghainese assert the soup was made popular in Shanghai and it was there that the Chinese learned to enjoy it. 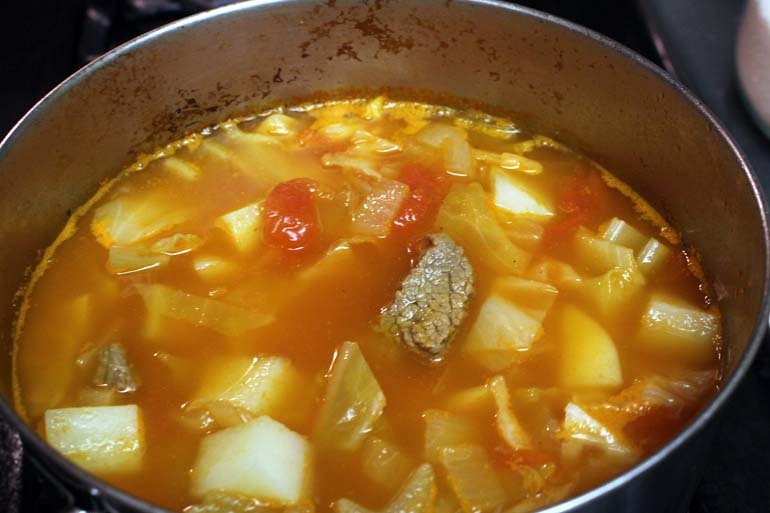 What is not in doubt, however, is that this soup is based on the Ukrainian beef and cabbage borscht. The recipe closely follows the original in ingredients but without the beetroots. The cooking technique though has been slightly modified. In the Chinese version the meat is par-boiled, as is the norm in Chinese techniques, instead of being seared before being made into soup. 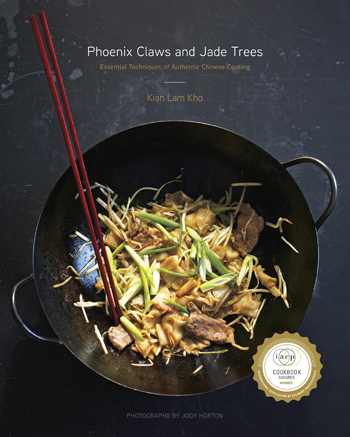 Some variations also call for ginger as an aromatic making it taste even more Chinese. I can’t help but wonder if Russians and Ukrainians would recognize this as borscht? 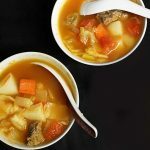 Or should we just call it Chinese beef and cabbage soup since it’s been so altered? Nevertheless, this warm and hearty soup was just the perfect antidote for this snowy day. Bring a quart of water to a boil in a saucepan then add the beef. 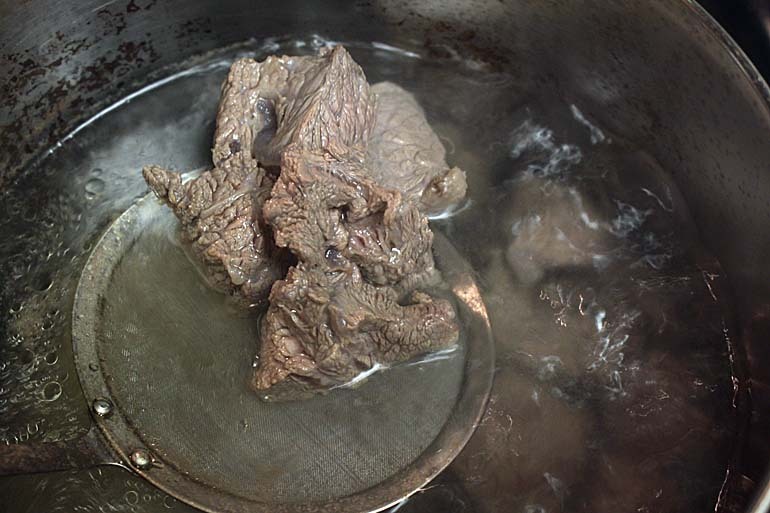 Par-boil the beef and scoop as much of the scum from the top of the liquid as possible. Cook for about 15 minutes or until no more scum forms on top. Drain the meat and discard the liquid. Put the beef, three quarts water or beef stock and wine in a 4 ½ quart stock pot. Bring the liquid to a boil then turn the heat down to low. Simmer the stock for about one hour or until the beef is tender. The liquid should have been reduced to about two quarts. Add the tomato paste and carrots to the pot and continue to simmer for about 10 minutes. Add the rest of the ingredients to the pot and continue to simmer for another 10 minutes or until all the vegetables are tender. Adjust the seasoning if necessary.